We find the antecedent for the pronoun “he” in verse one to be the prophet Amos. Take note how Amos begins his prophetic message. “The LORD roars from Zion…”. When we read this we understand the LORD to be God. But to the ancient hearers they understood the use of the word in a more specific sense. This was not just God, it was Yahweh (His covenant name), the God with whom they departed covenant relationship. 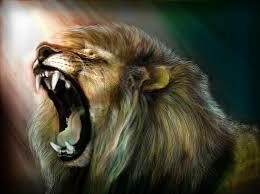 Yahweh roars because He is mad. I believe I would melt into a puddle of goo if God were to speak with me audibly in a normal speaking voice. I cannot imaging Him roaring! The fact that the prophet points out God roars from Zion, was most likely said to underscore the Northern Kingdom’s disobedience. They should not have their capital in Samaria when God is clearly speaking from the Southern Kingdom’s capital region of Zion. The fact that Yahweh, “utters His voice from Jerusalem…” is probably why God chose his spokesman from the area of Jerusalem and not somewhere from within the Northern Kingdom. Yahweh speaks from Jerusalem, so His messenger will be from there as well. When God speaks it is a word of comfort, encouragement, or instruction to those who are walking in right relationship with Him. To those who have broken covenant relationship with God it is a word of judgement, discipline, or rebuke. If the “pastures of the shepherds mourn” it is because the shepherds are not in right relationship with Yahweh. Consider the last part of verse two. “And the top of Carmel withers.” Is that scary? So what if the top of the mount withers, do I care? Well, what if “the top of Carmel” is a figure of speech conveying a slightly different meaning? According to Wikipedia, Mount Carmel is a coastal mountain range in northern Israel stretching from the Mediterranean Sea towards the southeast. It is a 24 mile long mountain range somewhere between 4 and 5 miles wide. The northeastern face is approximately 1,791 feet high. Probably Mount Carmel’s most significant characteristic to our study is that it has been considered a sacred site for many false religions spanning thousands of years. The Egyptians, Assyrians, and Phoenicians all worshiped false gods there. Remember the story of Elijah and the 450 prophets of Baal? That was on Mount Carmel. When this passage talks about the top of Mount Carmel withering, I believe it is talking about the Word of Yahweh destroying the false religions represented there. I think this clearly indicates God’s superiority over not only a physical mountain range, but the false gods worshiped there. Man will always worship something or someone. It is deeply embedded in human nature. People will either worship false gods, creation, themselves, or Yahweh the covenant God who redeems mankind through the life, death and resurrection of Jesus Christ. When reading the Bible it is so easy for us to gloss over what we don’t understand. If something we encounter in God’s Holy Word seems boring or insignificant, chances are we are missing something. We may not understand the cultural, historical, or geographical significance. But be assured, there are no wasted or unimportant details in the Word of God. This Holy message we know as the Bible has been carefully crafted to communicate exactly what the creator of the universe wishes us to know. Remember, to worship someone or something other than the one and only God, feigns freedom from accountability to Him. However, God created all of mankind, then He redeem mankind with the blood of His dear Son Jesus the Messiah. We may not think we answer to God because we choose not to worship Him or even acknowledge His existence, but God is not dissuaded by our decisions. We are accountable to God because He created us and offers us repentance, redemption, and restored relationship with Him. God and God alone is truly worthy to be worshiped! 3 Replies to "Amos - When God Roars"
This is a good reminder that God isn’t a cute cuddly buddy who just wants to be our friend but he is a Holy God who should be feared and summited to. Thanks for your comment Brother! I agree! Sometimes we get so wrapped up in life and its struggles that we can forget that God is to be feared, respected, loved and obeyed. He is love and He is a consuming fire. God is truly worthy of our praise, worship and adoration. Thanks for the cultural, geographical and historical input. This verse caught my eye at first and I understood harsh wrath was taking place at apparently an increasing level in each sentence but I really appreciated understanding the full significance with the background information.